FaceLogin - Login by looking your PC. Login by looking your PC!! FaceLogin allows you to login to your PC by looking at your webcam. FaceLogin associates user accounts with a picture, and then, when looking at your webcam, you can login because it detects you on the webcam. 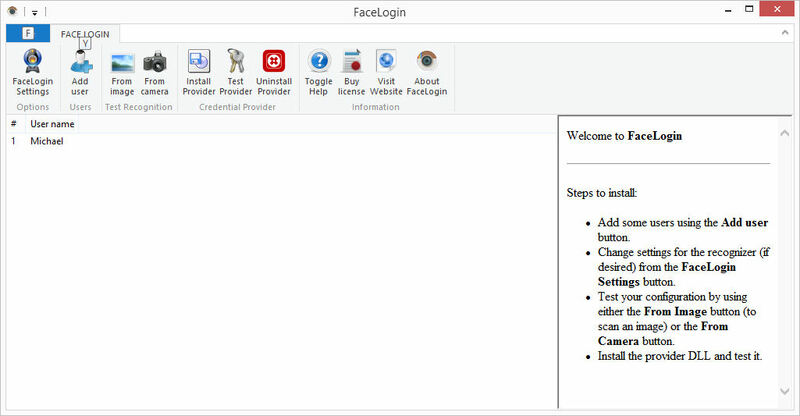 Only an administrator can run FaceLogin and change its settings, but all configured users can use it to login. FaceLogin needs your password in order to login. It stores the password in a secure way, but no storage method is 100% secure. The more images you add for a user, the better the detection. Authentication is 2-way, because data from a photograph cannot be exact-to-bit. Therefore FaceLogin stores your passwords and photos, they are securely stored anyway (meaning that no unathorized user can access them), but the fact that data is stored makes it a potential target. Use at your own risk. No face detection algorithm is perfect. FaceLogin uses all the OpenCV face detection algorithms (and you can choose what to use), there are small chances that FaceLogin won't recognize your face (so you have to login with username+password), and an even smaller chance that FaceLogin will recognize someone else as you and login. Use with caution and at your own risk. FaceLogin download is available with an evaluation license. Once you test it works for you, you can get a personal or a business license. FaceLogin is portable. You can run it from wherever you want. It creates users and provider information in the system directories. Remember to read information and security considerations - FaceLogin is a 2-way authentication mechanism, so your passwords are stored. Add some users using the Add user button. The more images you add, the better the detection. Change settings for the recognizer (if desired) from the FaceLogin Settings button. Test your configuration by using either the From Image button (to scan an image) or the From Camera button. Install the provider DLL and test it. Single user mode installation, this installs a system which tries to detect faces from all the registered users and logins the appropriate one. This method works better in Windows 7, because in Windows 8 you have to select the "other user" option. Multiple user mode installation, which installs icons for all the registered users and each icon only tries to detect faces from its related user. This method works better in Windows 8, but it is also valid in Windows 7. Camera allows you to use your webcam for recognition. If this is set to simulation, then the Login Provider will ask you to pick an image file (JPG/PNG) instead of capturing the camera. You can either use DirectShow, Media Foundation or OpenCV. The default is DirectShow and the recommended one. Media Foundation is faster, but not all webcams are compatible with it. With OpenCV capture it might or might not work. Just try all the available options. Algorithm allows you to select which algorithm will be used to detect the face. If you select "All methods", then all 3 algorithms are used and the best prediction is returned. Algorithm threhold is the detection threshold applied to EigenFace or FisherFace. The default is 10 and it's best to leave it as is. Similarity threshold is an algorithm applied to verify that the identified face is also a known face (i.e. it is not someone unknown). If the similarity of the matched face and the trained face falls below this limit (which can be 1-1000, with 400 the default), then the face is considered unknown. 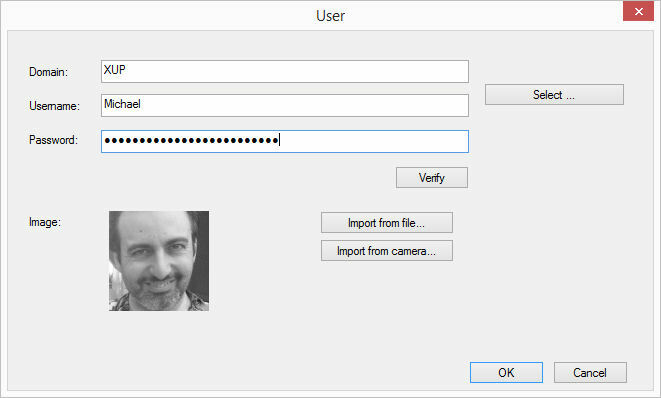 Use this to allow FaceLogin to discard a login if the face captured is not a known one. Confidence thresholds are values that the algorithms return when detecting a face. The lower the number, the higher the confidence of the algorithm. The values you put there depend on the quality of your camera. If blank, no extra verification will be done. If you put a number, then any face detected which as a confidence value greater than what you specify will be dropped. Required successful shots for login indicates how many shots FaceLogin should take and verify before it proceeds to login. 5 is the default. Sounds enables or disables sounds.